In the last decade, mounting evidence from mice studies has shown that reversing aging in certain tissues may be possible. In the journal Cell, Gomes et al. 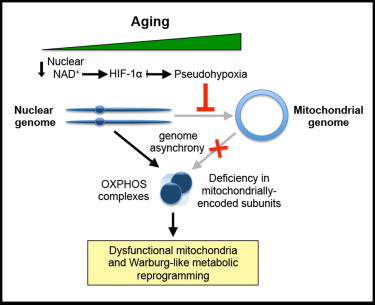 focuses on age-associated mitochondrial dysfunction and key protein regulators in aging. They show that in the skeletal muscle of moderately old mice, age related loss of mitochondrial oxidative phosphorylation (OXPHOS) gene expression, is responsible for decreased muscle function. The addition of a NAD+ precursor restores normal muscle function and OXPHOS, but not muscle strength. However, in very old mice, the treatment is insufficient. In very old mice, both nuclear and mitochondrial OXPHOS expression is reduced, and mitochondrial DNA integrity is diminished. The authors conclude that age-associated oxidative phosphorylation (OXPHOS) defects in murine skeletal muscle are thus biphasic. The irreversible phase 2 dysfunction, they propose, is caused by a decrease in NAD+ and a loss of nuclear SIRT1. This effects the stabilization of hypoxia associated transcription factors, and promotes a hypoxic-like (Warburg effect) state in the cell. The exact mechanism of irreversible dysfunction remains to be elucidated, but Gomes et al. show that early mitochondrial aging can be partially reversed.